"The solitude of women’s minds is regrettable, I said to myself, it’s a waste to be separated from each other, without procedures, without tradition." I need time for my heart and my mind to recover. And to think this isn't the last book of the series. 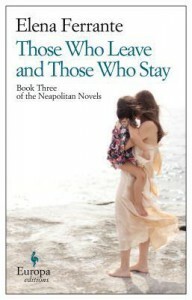 Elena Ferrante is a master storyteller. How is it that she can truly capture the good, the bad, the despicable, the intimacy of female friendships? How can she effortlessly capture the impossibility of surviving in a patriarchal society? Her tale and her words have me utterly spellbound and also terrified. With each passing book, I find myself loving Lila's unbreakable and fragile spirit more. I wish I had her strength, her resolve. But if I had to choose whom I resembled the most, it would have to be Lenù. Succumbing to the pressure of who we need to be, trying to leave our hometown before it swallows us whole and erases our dreams, and makes us forget who we are. What will happen to Lila? What will happen to Lenù? I'm scared of finding out.